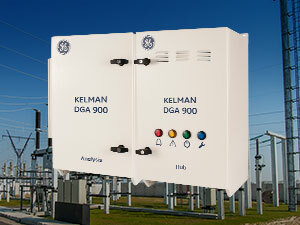 United Kingdom, June 2017 - GE is proud to introduce the Kelman™ DGA 900, our next generation multi-gas on-line Dissolved Gas Analysis (DGA) and moisture analyzer, which once installed on a transformer will help detect and diagnose incipient faults and trend asset health via the monitoring of 9 critical gases plus moisture. This can be applied to any mineral oil, natural or synthetic ester fluid filled power transformer used in generation, transmission, distribution and industrial applications. Today, as the global average age of transformers continues to rise and grid architectures become more dynamic, the possibility of rapid ageing, unplanned outages and even catastrophic failure between off-line tests also increases, leading many asset owners to adopt on-line DGA monitoring strategies to increase network reliability and operational efficiencies. The Kelman DGA 900 is designed to cater for this need and utilizes an evolved implementation of GE’s proven Photo-Acoustic Spectroscopy (PAS) measurement technology, providing laboratory challenging levels of precision and repeatability with no consumables and no need for frequent re-calibration. Scalable and Connected: Highly expandable analogue and digital I/O and integrated computing power provides a platform ready for expansion and future feature enhancements, complemented by a large range of secure communications option. The Kelman DGA 900 is an invaluable foundational tool for implementing Asset Performance Management (APM) across electrical generation, transmission and industry, enabling a condition based asset replacement strategy and delivering improvements in system reliability and availability. A DS-Agile™ and PREDIX™ Grid APM ready device, the DGA 900’s wide range of communication methods and protocols enables connection to those platforms and integration with GE’s Perception™ transformer fleet management software as well as other software, historian and SCADA systems.